Survival Supermarket has been one of the initial sponsors of Guyana Softball Cup, and during the fourth edition of the country’s premier softball tournament, the company, through its Travel Agency, will afford two lucky spectators a trip to the beautiful island of Aruba. 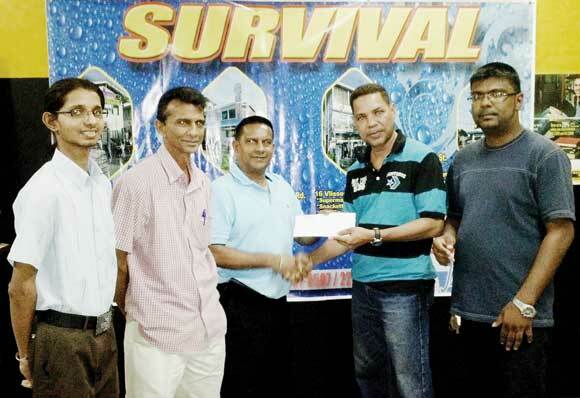 Assistant Manager of Survival Travel Agency, Mark DeFreitas (second right), presents the tickets to Rohan Booj-Raj of the GFSCA in the presence of other representatives of the two bodies. At a simple ceremony at its Vlissingen Road branch on Saturday morning, the Assistant Manager of Survival Travel Agency, Mark DeFreitas, presented the two tickets to members of the Guyana Floodlight Softball Cricket Association (GFSCA), the organising body of the October 31 to November 2 competition. DeFreitas said Survival is proud to once again be associated with the tournament, which has attracted teams from Guyana and North America competing in the Open and Masters categories. Receiving on behalf of the GFSCA was Rohan Booj-Raj, who expressed gratitude to the entity for staying the course with the Guyana Softball Cup. Booj-Raj said the investment by Survival is significant, noting that such strong support is vital to the success of the tournament. To qualify for a chance to win the trip to Aruba, spectators need to retain their half tickets on the day of the finals and listen for their numbers to be called over the Public Address system. Meanwhile, another member of the association, Dharam Persaud, said the organising team is on top of its work with less than two weeks to go before the official bowl-off. Persaud added that all the logistics have been finalised and it’s now just a matter of execution. The Guyana Softball Cup commenced in 2011 and instantly became a hit with players and fans alike, attracting massive crowds and also putting some hard earned cash in the pockets of those who entertain with bat and ball on the field. This year promises to be even better, as the GFSCA is aiming to surpass the achievements of the previous three years in terms of spectators’ involvement and the handsome rewards at stake for the players. The champion team in the Men’s Open is guaranteed a whopping $800,000 first prize and a huge trophy, while the losing finalist will have to settle for $200,000 and a trophy. In the Masters’ division, the winning team will pocket $600,000 with the runner-up assured of $150,000. The Man-of-the-Match in both finals will receive a trophy. As has been the case in the past, the Most Valuable Player of each category will become the proud owner of a softball bracelet, made of gold with diamond studs, compliments of Steve’s Jewellery. On the day of the final, apart from the trip to Aruba, there will be lots of hampers and giveaways for spectators. Two dozen teams will compete in this year’s event, with 12 from Guyana, seven from New York, three from Florida and two from Canada. During the three-day championship, there will be a total of 36 preliminary games, followed by four semi-finals and two finals. In an effort to expand the reach of the competition and ensure maximum participation from spectators, the organisers have increased the number of venues this year. Grounds earmarked to host games are Police Sports Club, Everest Cricket Club, Georgetown Cricket Club, Demerara Cricket Club, Ghandi Youth Organisation, Muslim Youth Organisation, Enmore Community Centre and Enterprise Busta Sports Club. Trophy Stall and New York Better are the defending champions of the Open and Masters categories respectively, while the previous champions were NYSCL New York (Open) and Savage Masters in 2012 and Cotton Field Wild Oats (Open) and Regal Seniors (Masters) in 2011. According to information emanating from the GFSCA, this year’s tournament has an estimated budget of around $10 million.